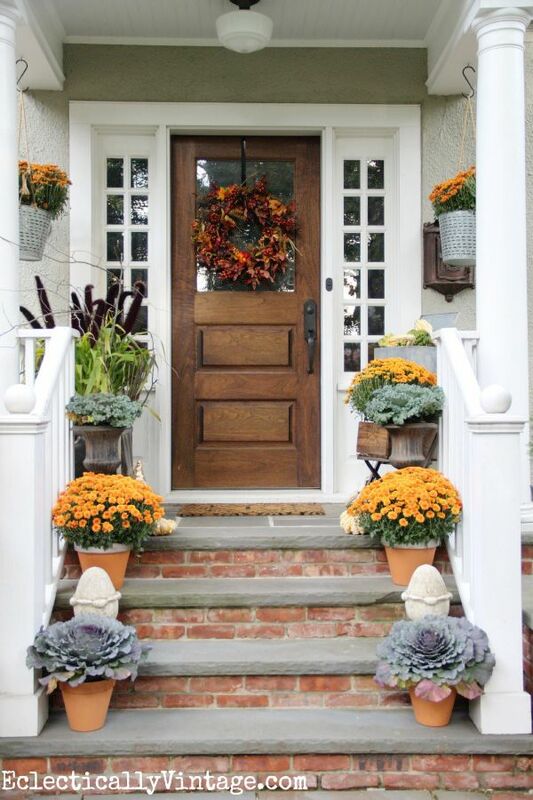 One way to make a good impression to your guests is by investing on beautiful front door planter ideas. For most homes, it is the front door that welcomes visitors and is one of the first things that people would see when looking at your home from the outside. It is therefore necessary that you give your front entrance the care and attention that it deserves. You do not really need to spend a lot of money to come up with a lovely front door planter. Simply put your DIY knowledge and skills to good use. In fact, you can come up with a beautiful planter using recycled materials. Of course, make sure you also choose the most beautiful plants to grow on the planters. Fill the planters with bright blooms, fall foliage, topiary, seasonal grasses or perhaps a combination of these plants. Remember that the focus is often on the plants and not much on the planter. No matter how beautiful your planter is, you can’t make a good impression if you have chosen the wrong type of plants to grow in it. 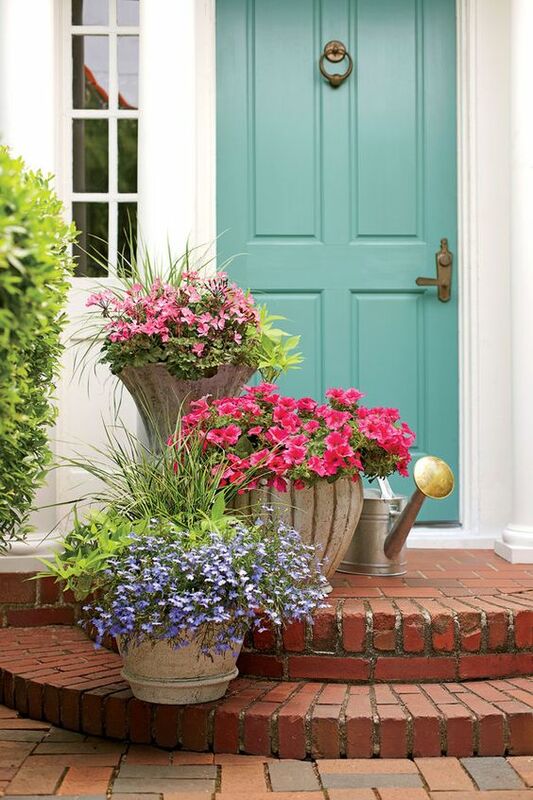 To achieve an instant curb appeal on your front door, decorate your home with these 36 lovely front door planter ideas. Also known as flower boxes, planter boxes are handy and functional. 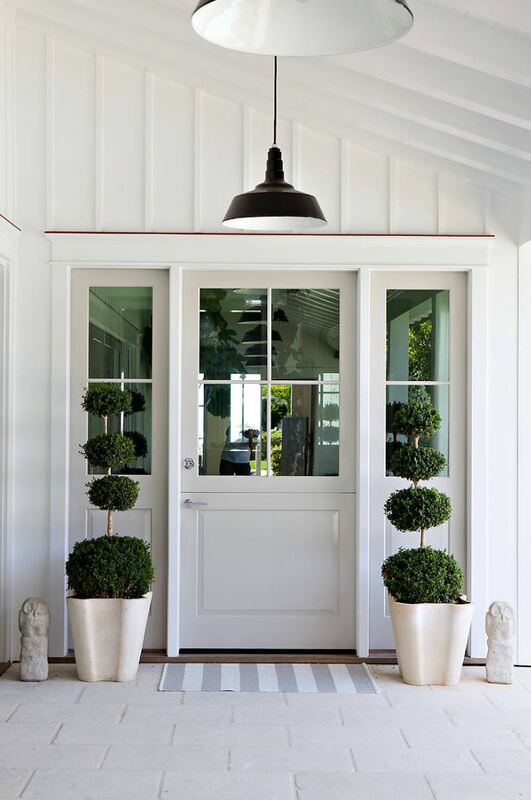 These boxes can be moved easily, which makes them a great choice for your entryway plants. 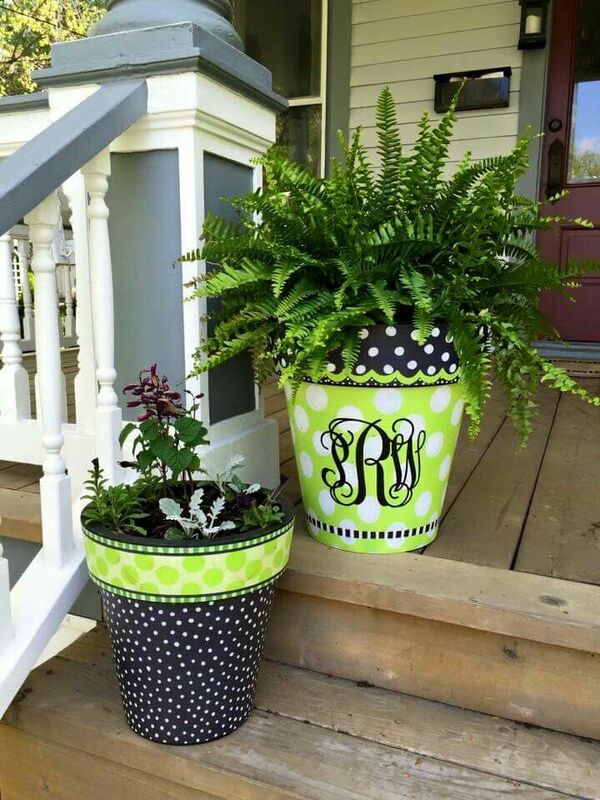 Aside from the front door, these planters can also be used to decorate the patio, decks and terrace. They are truly versatile and look stunning when planted with colorful flowers. If you are equipped with DIY skills, you can choose to build your own front door planter boxes. Building the planter is not that difficult, for as long as you have the right materials and tools. They can be made in different materials and built in specific sizes as well. If you do not have the luxury of time to build your own planter, you can choose to buy them from your local nursery store or garden center. Another great thing about using front door planter boxes is that you will have the opportunity to grow delicate plants that may otherwise succumb to insects, pests and mud splatters when grown on the ground. While flowers are among the most popular choice of plants for planter boxes, you can also choose to plant it with hedges, topiary, foliage and ornamental grasses. 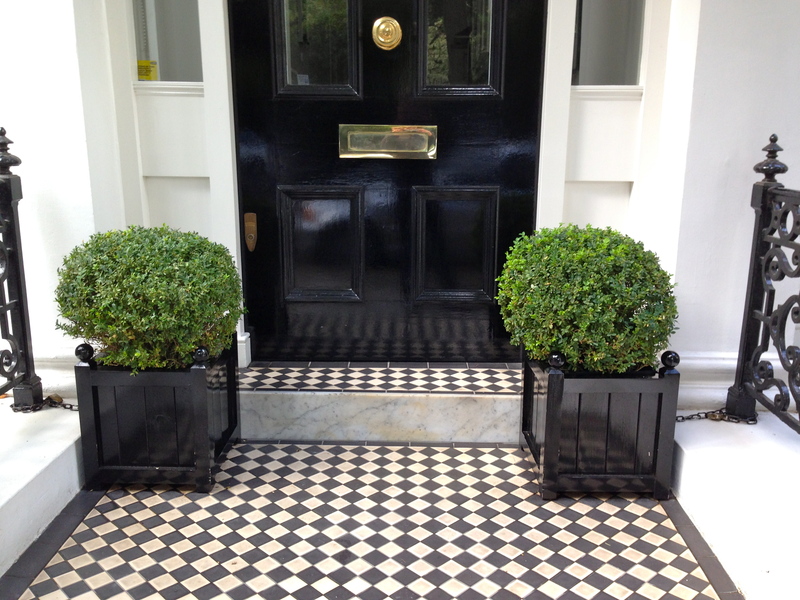 Here are some ideas to consider if you will opt for the planter boxes for your front door planter ideas. 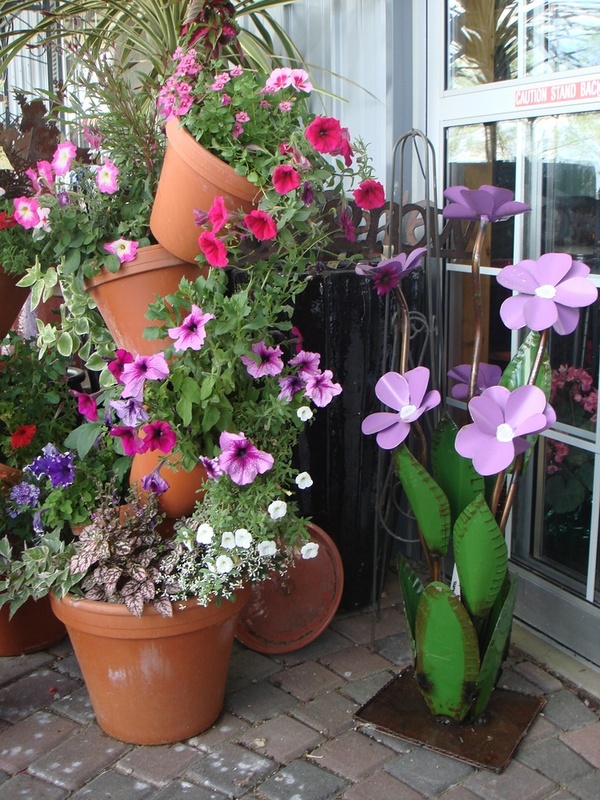 Another way to show off your entryway plants is to build a flower tower. This is a great way to make your front door to stand out and is also a great option for those who have limited spaces on their front door but would like to grow several plants and flowers. 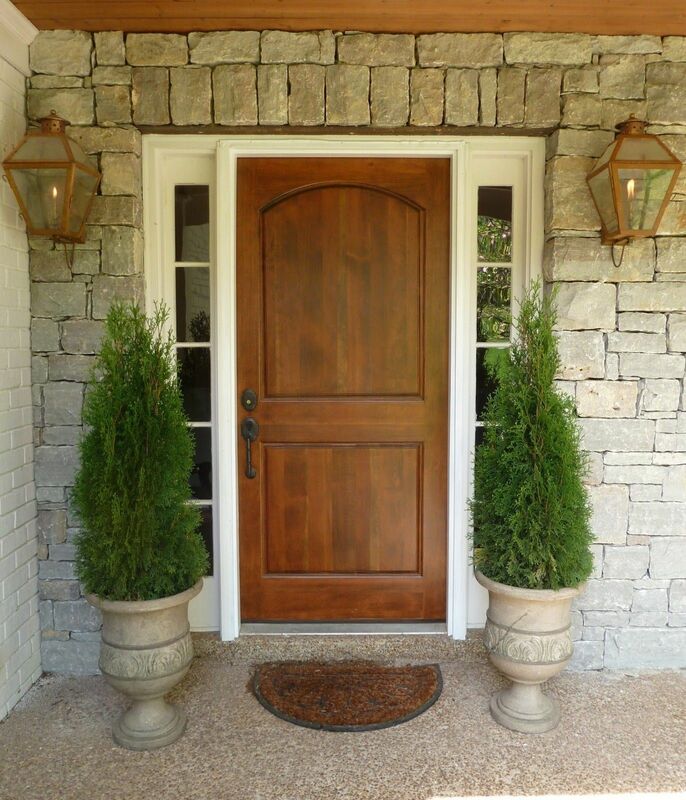 You will find so many DIY tips online when it comes to building these types of front door planters. Fill the tower with the adorable and sun loving petunias. 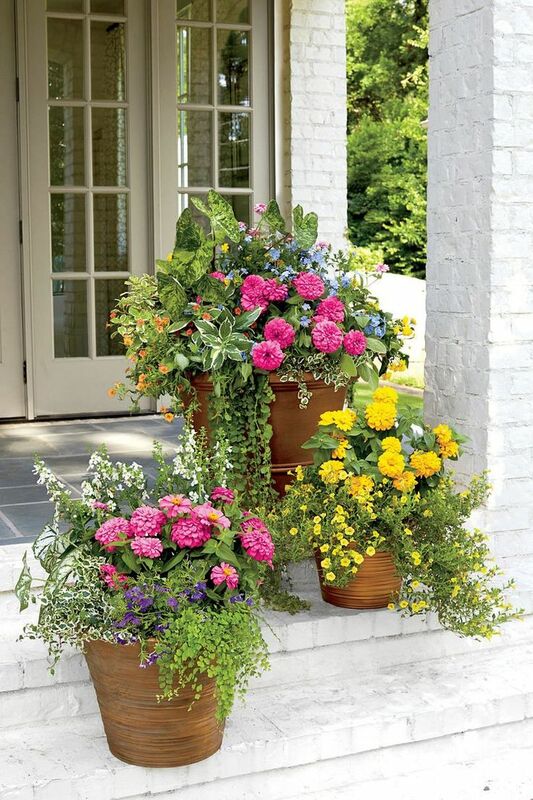 These colorful flowers will bloom in spring and will make your front entrance look stunning. You can also include a bed of shrubs around the planter in order to boost your home’s curb appeal. 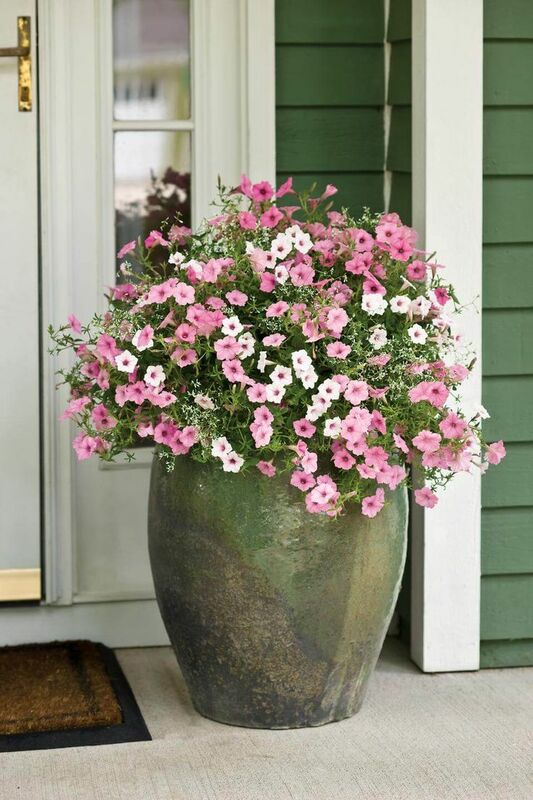 Aside from the petunias, there are several other plants for front door entrance that can work well for your flower tower planter. 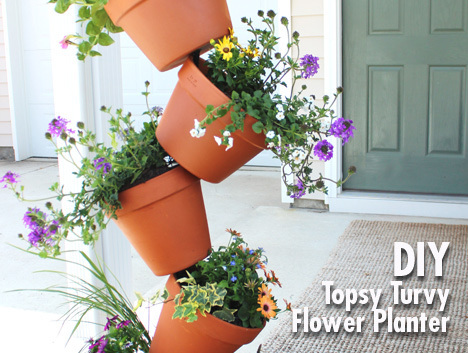 It’s easy to build your own flower tower and you don’t need to purchase new pots to use for this project. You can use different materials, such as old tin cans and plastic containers that you can paint with any color of your choice. Aside from the fact that the towers are easy to build, they are also adorable and will surely make your front entrance look absolutely stunning, especially if you choose to grow colorful flowers in it. 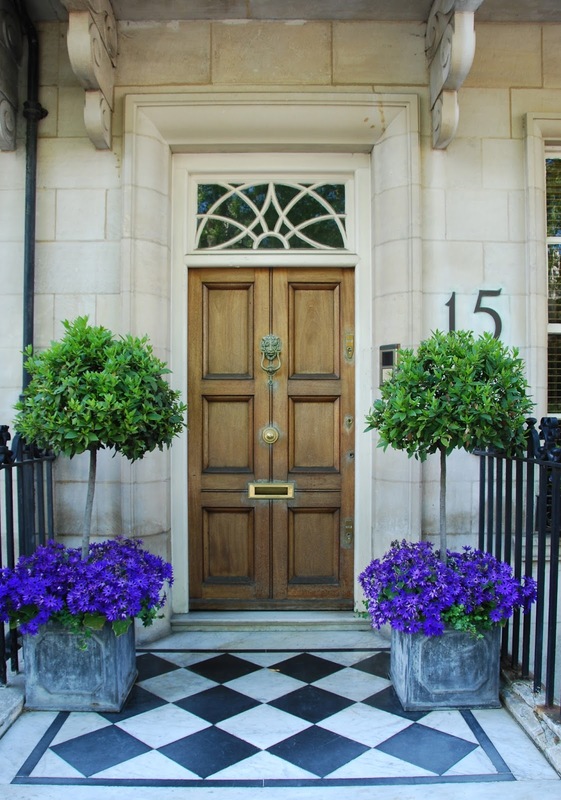 If you need ideas and inspiration, here are some lovely flower tower planters for your front door. A beautiful hanging planter filled with adorable flowers will surely wow any of your visiting guests. You can hang the planter right into the door itself or you can place it somewhere in your porch. There are several hanging front door planters that you can purchase from a local garden center or from the Internet. But if you want to save money and you think you have the luxury of time to work on a DIY project, consider creating on your own! Building a hanging planter for your front door is just so easy. You just have to rely on your creativity to come up with one. In fact, there are lots of recycled materials that you can use as pots. The more creative you are, the easier it is for you to see things that you can use as a hanging planter. A sure-fire way to create a dramatic statement in your front entrance is to place one bold plant in the middle of your hanging planter. Surround it with a clump of ornamental grasses or shrubs. 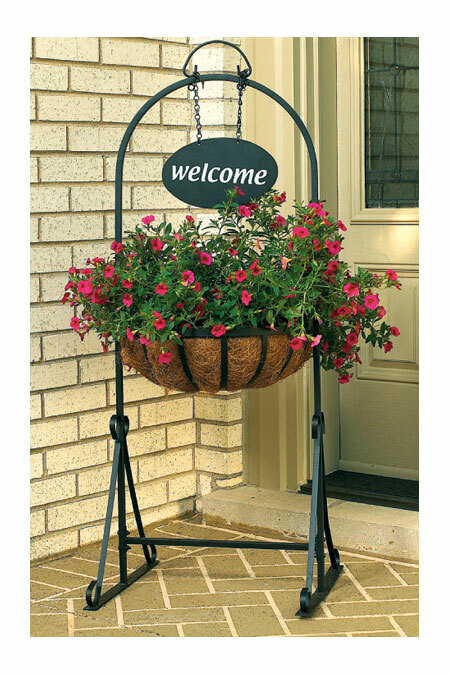 Colorful flowers such as begonias, petunias and geraniums are among the most adorable plants for front door entrance and they will stand out even more if you hang them in your front entrance. 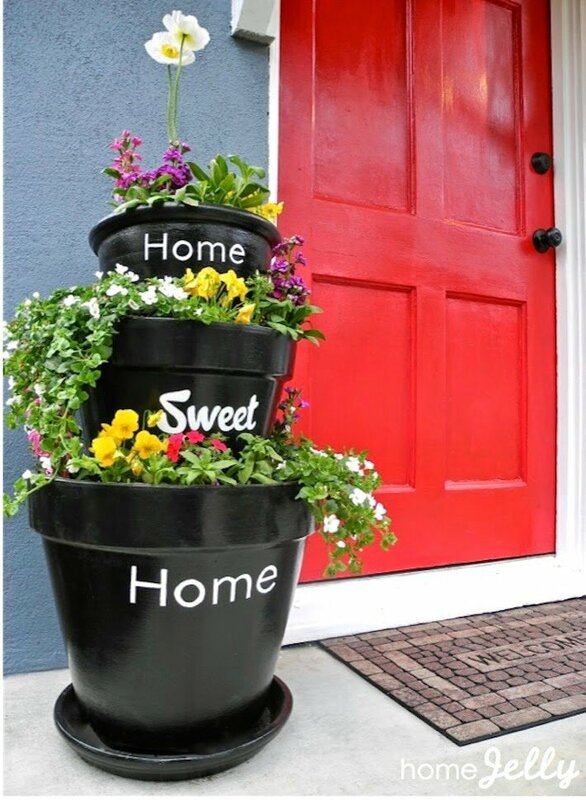 Here are some of the most adorable hanging front door planter ideas to keep you inspired. 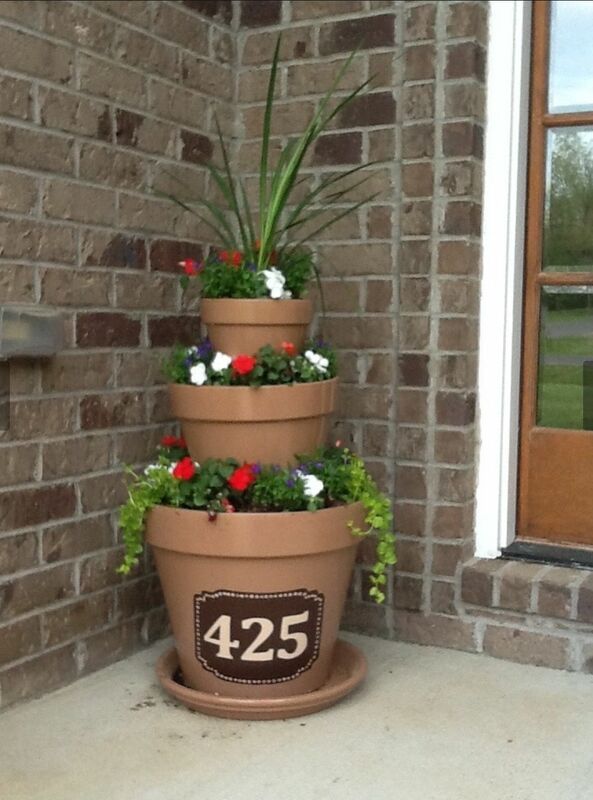 Some of the most beautiful front door planter arrangements are placed in a beautiful flower pot. 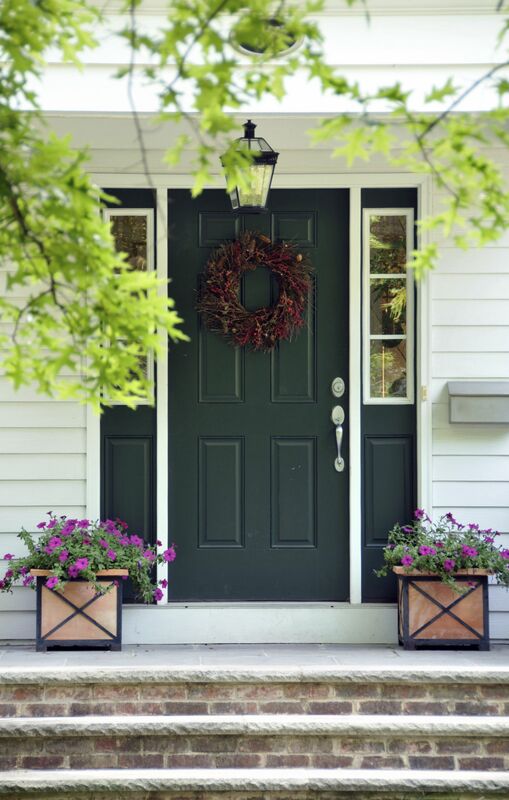 Although it is the plants themselves that command attention, the containers or pots where they are grown can also affect the overall look of your front door. If you want to enliven your front door with pots, it’s also important that you carefully select the plants that you will grow in it. They should be able to thrive well on drained soil. Furthermore, you also need to consider the drainage options. For instance, if you live in the upper floor of an apartment building, you could end up creating a slipping hazard for your neighbors each time you water your plants. 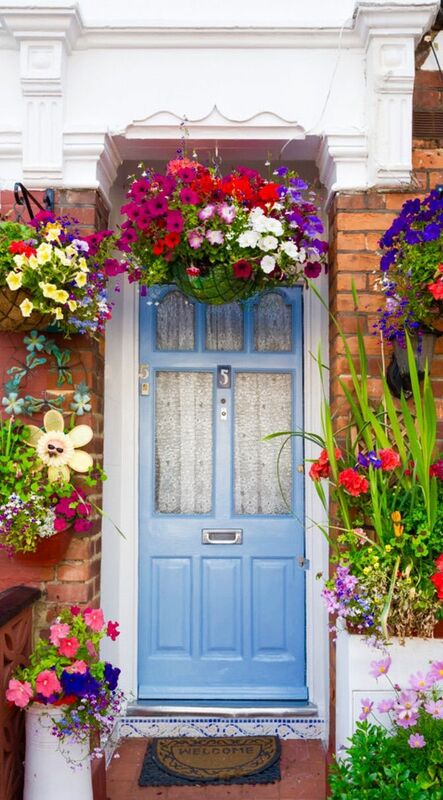 Colorful flowers look great on your front door entrance. 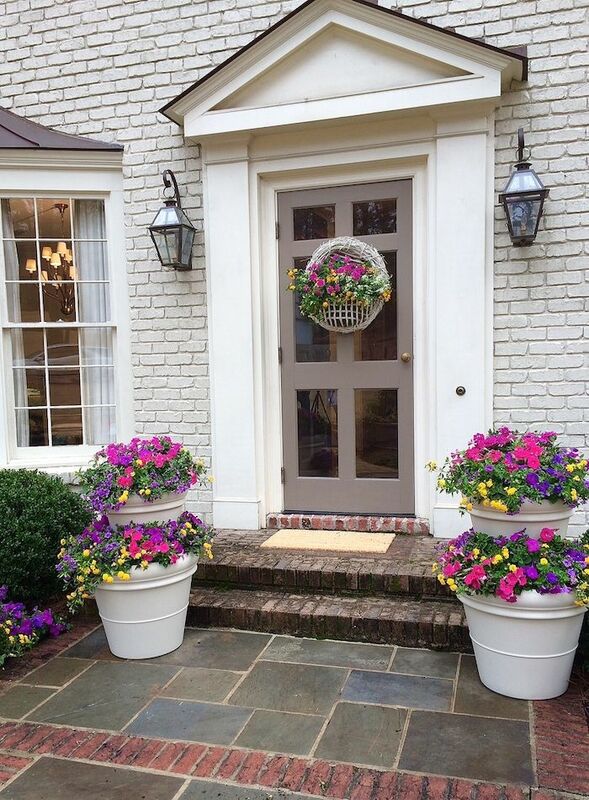 A well-composed front door flower pot can look as visually stimulating as a landscape painting. If you want to brighten up your front facade, combine bright colors such as orange, purple, pink, yellow and blue. It’s also possible to come up with a sophisticated look in your front door by using greens, silvers and whites. 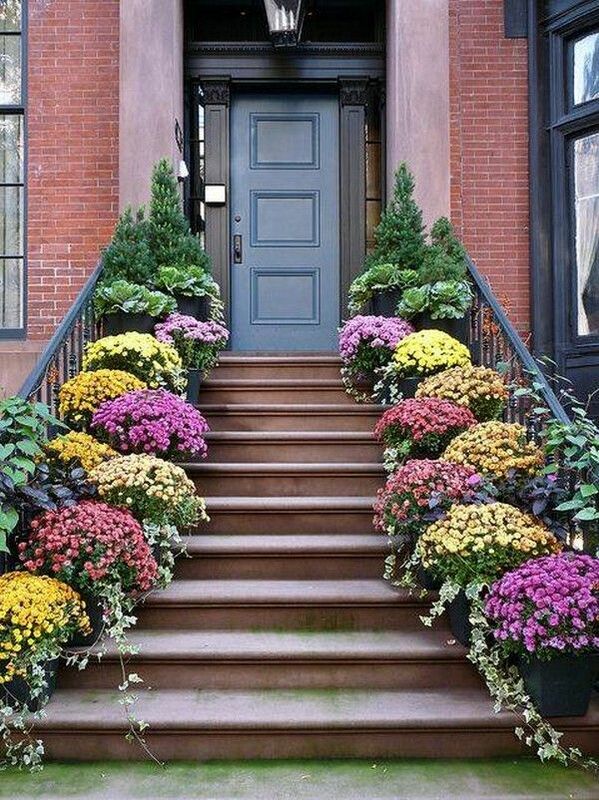 When choosing the color of the flowers and foliage, think of the color of your door as well as the surrounding walls. That said, the use of beautiful flower pots present a great opportunity for you to play with dramatic color combinations to impress any of your visiting guests. 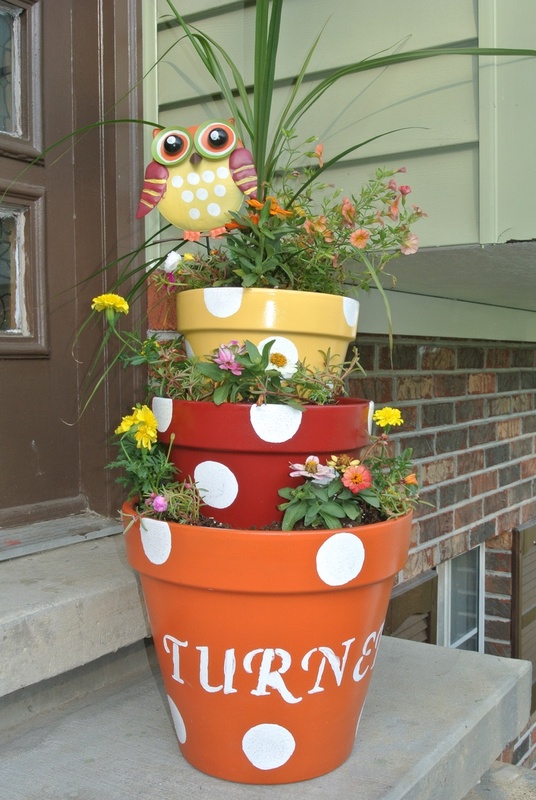 If you need more ideas, here are some of the most adorable flower pots at the front door. 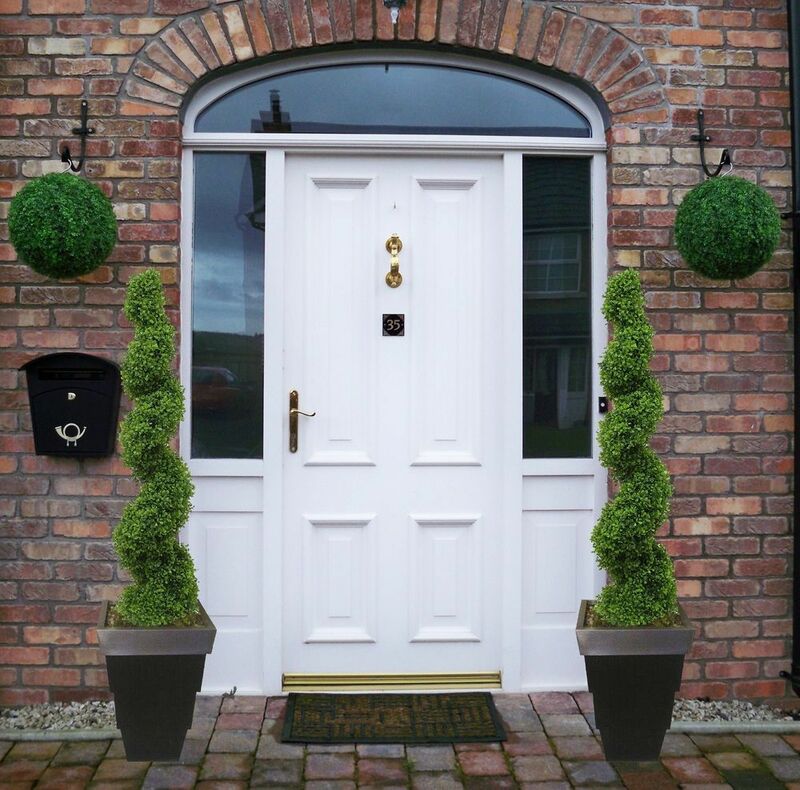 There’s nothing that can make your front door look more welcoming than having a matching pair of topiaries on either side of the entryway. 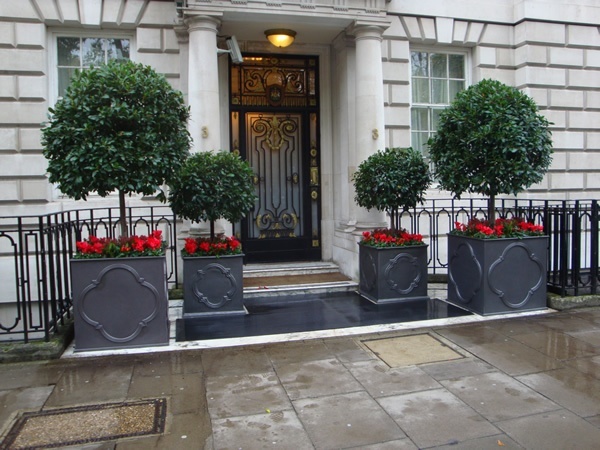 In fact, some of the most beautiful front door planter arrangements often include topiaries. These plants are available in different shapes, sizes and styles. They look really beautiful and are perfect for your front door planters. Topiary basically refers to the method of creating unique designs and sculptures using shrubs and trees. Evergreen shrubs with dense foliage are commonly used for topiary. Aside from making a great statement on your front door, these plants are also easy to care and maintain, which makes them an ideal plant for container gardening. When choosing the planter to grow your topiary, look for something that matches with the overall theme of your home exteriors. For instance, if you are trying to achieve a modern look for your outdoors, then look for modern designed planters to grow your topiaries. 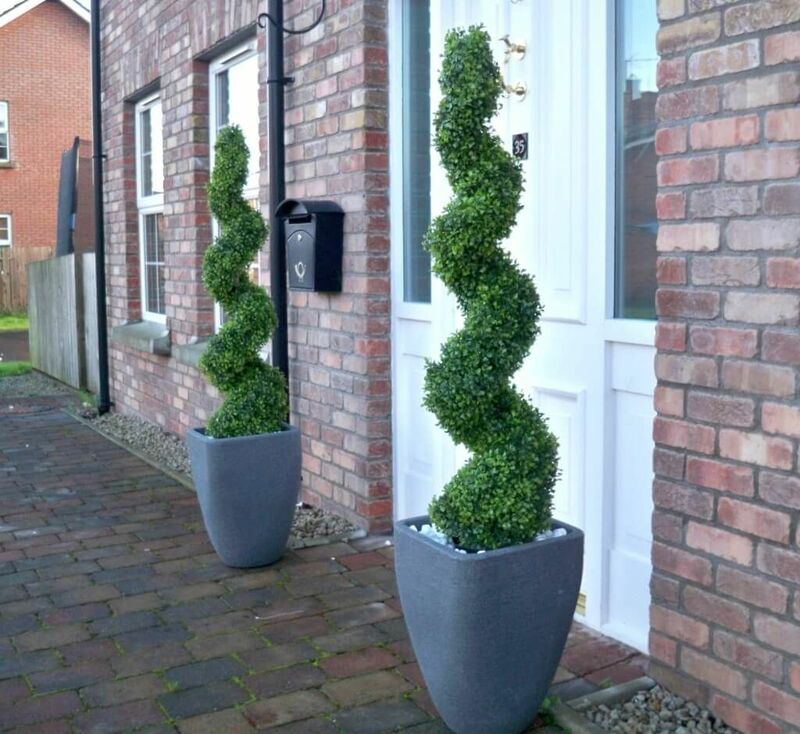 If you need more ideas when it comes to your topiary front door planters, check these out. 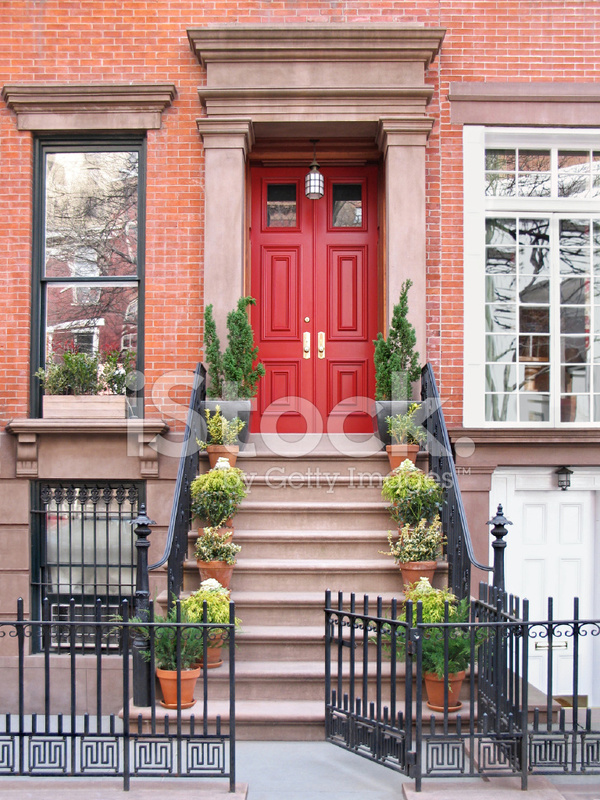 If your front door entryway has stairs, consider decorating the steps with some of the most beautiful front door planters. 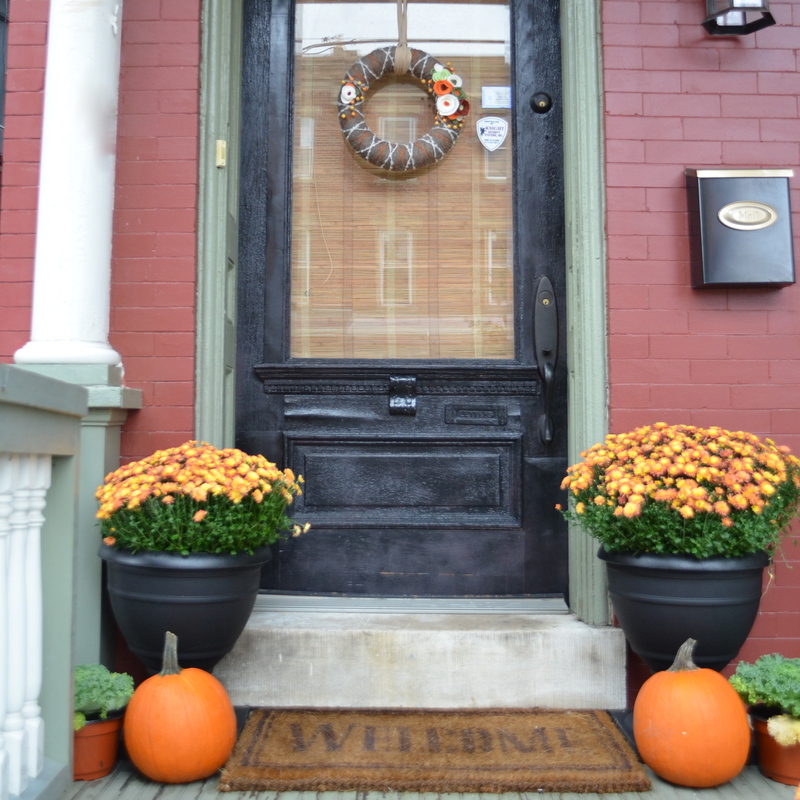 A well decorated entryway can greatly help to improve your home’s curb appeal. The planters can provide lovely accents to your overall home staging and helps to connect your indoor and outdoor decors. The entrance steps on your front door are not only decorative, but they are considered functional elements of your overall home design. They raise the floors above the ground and keep your entryway to look clean and well appointed. The entryway stairs also provide a unique architectural detail to your home facade. When decorating your front door steps with planters, you need to consider the other design elements present in your home exterior. For instance, if your steps are made of bricks, a planter made of clay may complement well with the design. The flowers and plants that you grow on the planter must also go with the overall look of your house. Remember, this is what people would first step on the moment they get into your house so you have to make sure that you are making a good impression. If you have stairs on your entryway, here are some front door planter ideas you can take inspiration from. 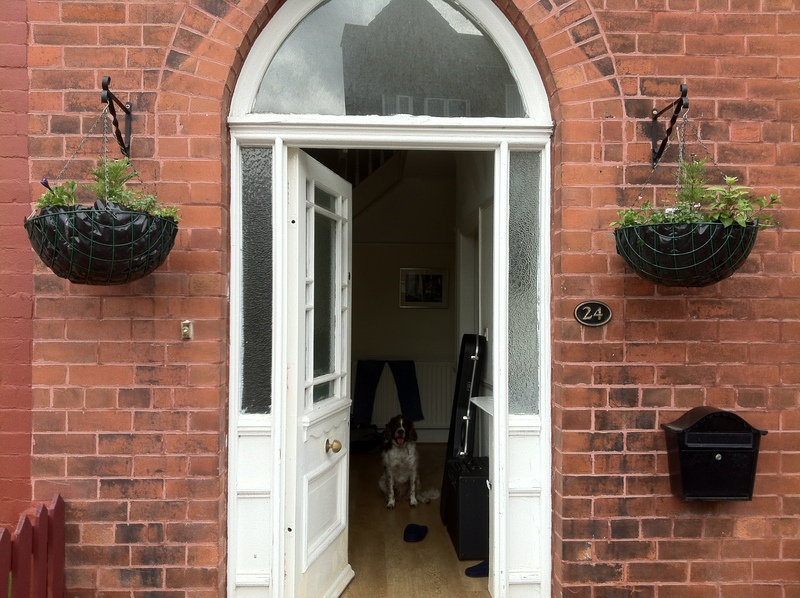 No matter how beautiful your home is, if your front door looks shoddy, you still will not be making a good impression. So use these front door planter ideas as your guide and decorate your entryway with the loveliest front door planters.